The last fifteen days have been very eventful. Work has been super busy with client reviews, which entail making scores of presentations, new business development pitches work; and my roommate flew down from Rochester, NY to come see me for the week. We consequently met some other Denison alumni and had a great time catching up at my favorite public park in the city. Additionally, I got a new phone, shoes, and my favorite purchase— 10 quirky socks from Jimmy Lion (sorry, papa). However, the biggest update from the past 15 days has been a medical scare in the family. My grandmother (mum’s side) underwent medical procedures which brought the whole family together. It allowed me to take time off from work and spend majority of that time with my nani. This entailed doing two things: talking about food, and playing cards. It’s family tradition to play cards with my Nani and Nanu. If they ever slept over at our house, we played cards and Nani always won. With her current procedure, we played almost every day for at least a couple of hours. Nani’s timid characteristics yet brutal card skills, Nanu’s constant whining about losing money, and my continuous failure at actually ever winning, all made for a fun time. Now with Andrew, my mom, and her older sister in the house, cards were a lot more fun (and somehow, I started winning). There are times when food brings people together and then there are times when people getting together make you want to make food. While our house is picky about what we eat and literally everyone eats something different (thanks to whatever diet we’re on). However, when a mass of people (by mass I mean more than 3 people) visit our house, things get slightly more regimented. We tend to eat one meal. The product of such decisions are almost always delicious. Like this weekend for example where we all ate mooli and aloo parathas with yogurt, mint coriander chutney, and beer. This was of course followed by a wholesome game of cards with Nani as the victor and Andrew and I as collective losers. In college, family style meals meant curries and rice. They were quick, filling, and simple — three things that make me the happiest. My go-to recipes were butter chicken and red Thai curry. I love Thai curries. In fact, one of the first recipes on the blog was a fragrant simple Thai chicken stew. 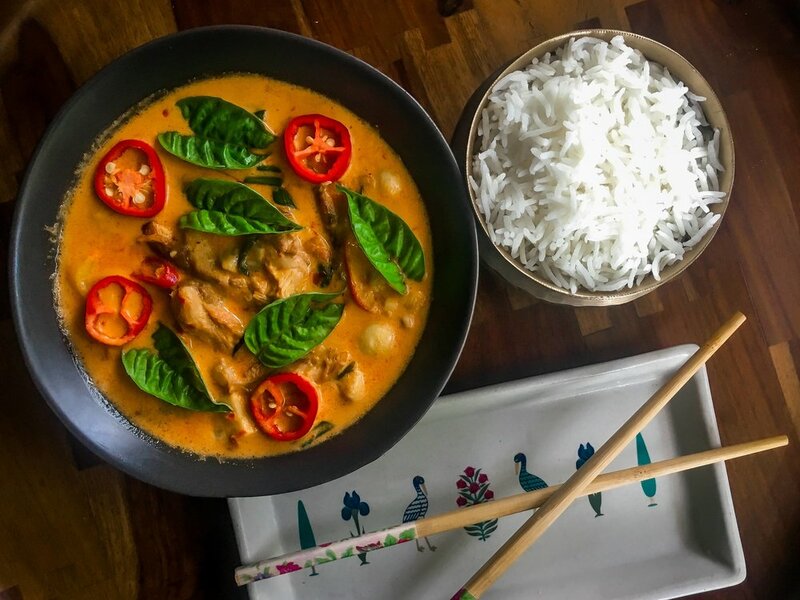 From what I understand about Thai curries (and I know very little), there is a base flavor that is associated with a color which is attributed to the ingredient being used the most. For a green curry, you use a lot of coriander and green chillies; for a yellow curry, its potato and turmeric; and for a red, yup you guessed it, dried red chillies. A red curry paste is 80% dried red chillies ground up in classic South-East Asian aromatics (ginger, garlic, lemongrass) with a salty component delivered by heaps of brined fish water aka fish sauce, and sweetened by an equally healthy helping of dark brown sugar. While in college, I used a pre-made paste, but I have been making my own paste ever since I moved back home. Indian dried chilies are amazing. In Indian food prep, we just add two chillies into any curry to infuse the food with a hint of the oils without overpowering it. In most dishes that I have had them, I have never actually tasted their effect in the food. It seemed more of a cosmetic than an integral spice adding to the flavor spectrum of the dish (like cumin or garam masala does). I just thought they aren’t spicy enough to really do anything. I could not have been more wrong. Blanching 8-10 chillies in boiling water and then blitzing them in a spice mill produces a potent paste, a whiff of which can pack a punch to your olfactory senses. The one big learning that I gained from making my own paste was that Thai food is very forgiving. It tells you that curry should be coconut based, spicy, salty, and controlled with sweet. And that’s it. How you get there is your adventure to choose. I hope you try this recipe. It takes no time to make the paste and it stores for a good month. Add boiling water to chillies and let them sit for about 30-45 minutes. Chillies should have swollen up and gone soft. Blitz in a spice grinder with all the ingredients needed for a paste other than oil. Oil has to be infused slowly as you bllitz the paste. This will incorporate the oils evenly. Add drops of water if the paste is to thick or coarse. In a skillet heat 1/2 tablespoon of veggies. Add pat dried and salted chicken thighs to steaming oil skin side down. Cook until the top of the chicken is brown and caramelizing. Add the remaining oil to a dutch over of a stockpot add onion greens until the they get translucent. Add other veggies (including all the leaves) and cook for about 1 minute. Add paste and cook for 2 minutes. Reduce heat, and add coconut milk. Add Sriracha, fish sauce and continuously taste. Based on how hot it is and how hot you want, add the sugar Accordingly. Once everything is mixed. Bring the curry to a simmer. Serve with basmati rice.